Click on the thumbnail on the left to open a large picture in this window. (Use the Back button to return). Other detailed photos are provided further down this page. Serial Number: Serial 735 stamped into the brass backing plate for the shutter and repeated in the adjacent wooden frame. Unmarked hand camera by Adams & Co with many unusual features. 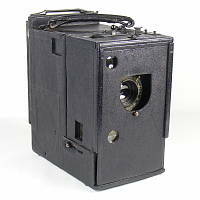 This camera has recently been identified as a modified No 3 Tella (see Notes). 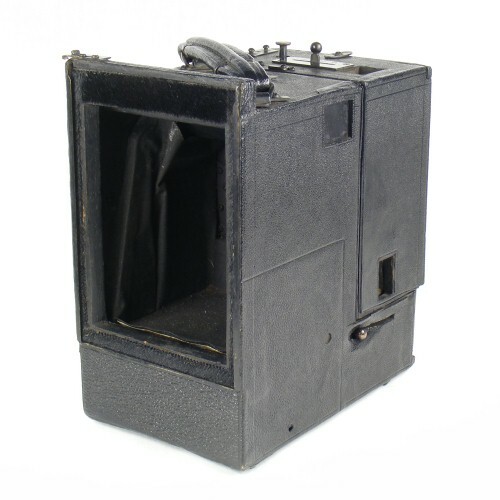 The cameras is a compact unit, but sturdily built with a mahogany body covered in fine black leather. The TTH Cooke lens lens has an iris setting that can be adjusted through the front opening. It has rack and pinion focusing with a scale marked from 2 yards; the mechanism is operated by a slider on the side. It also has a rising front. 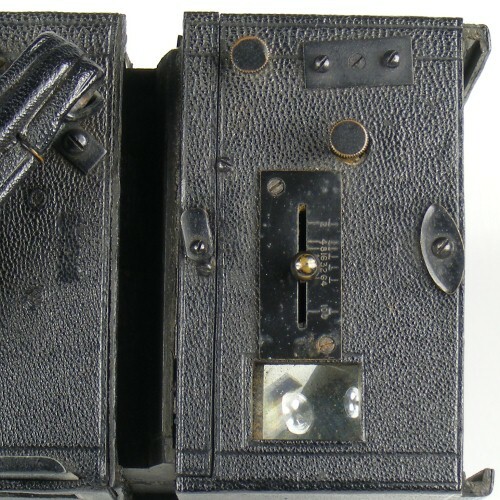 The Adams pneumatic shutter has a slider adjustment on the top of the camera to set the speed (½ to 1/100); the shutter still operates well although the timing is a little suspect. Refer to the detailed pictures further down this page. 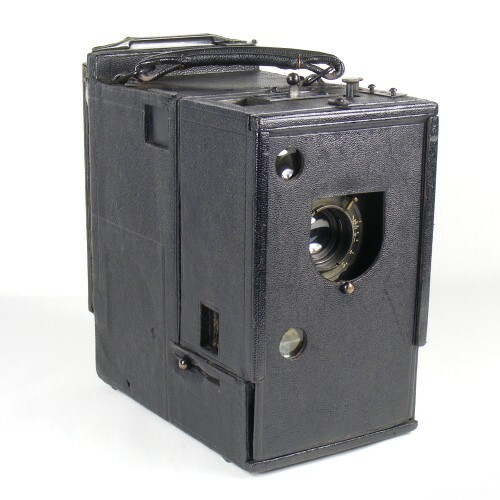 The camera came fitted with a conventional film pack; the holder might be an original Adams fitting as the leather covering is a close match to the camera. The front panel can be removed to reveal the lens assembly, but below it is a curious covered section. A short bar holds the cover in place, which is about 9cm x 2.5cm (or more exactly, 3.5" x 1"). The cover can be removed (it is covered with velvet on the rear face) to reveal a storage space that runs the length of the camera. Refer to the notes at the foot of this page. 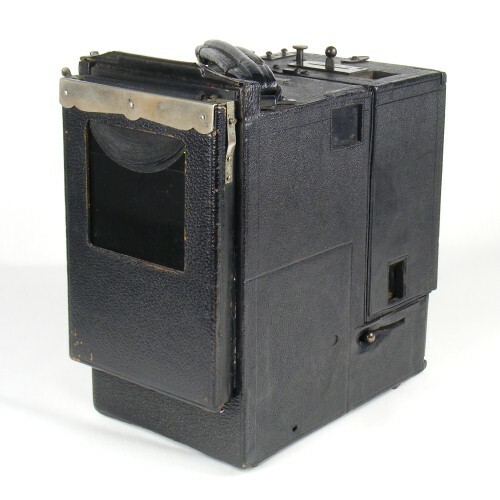 The second odd feature is at the top of the rear section where there is a metal 'window' that can be removed to reveal a space that runs the width of the camera but has roughly the same dimensions as the viewfinder windows, whose purpose was not initially clear. Photos copyright © 2012 David Purcell. Do not use without permission. 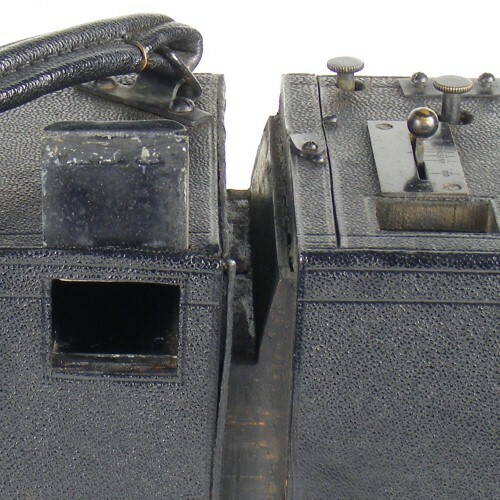 The pictures below show the camera with the protecting plate removed to expose the shutter assembly. Shutter cocked for 1/100 second. Compare the position of the cylinder on the right hand side relative to the slowest speed setting, shown in the previous picture. It now seems certain that this camera was originally designed to take Tella cut films. These could be loaded in packs of up to 50 films at a time. 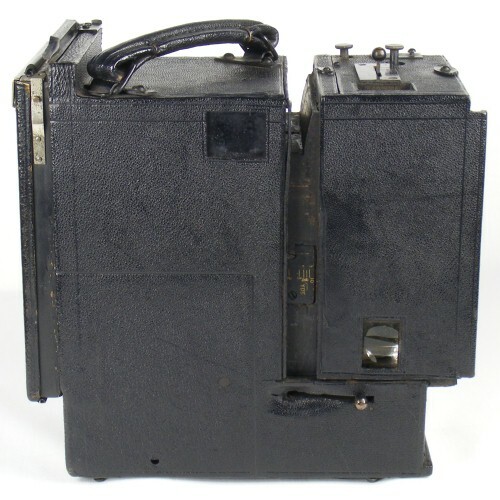 Adams produced a Tella camera specifically for these cut films. 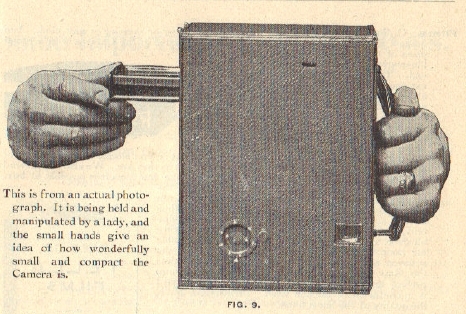 This is shown in an extensive advertisement in the 1899 BJPA, but the camera pictured in that advert is not this particular camera. The image on the left is taken from a 6 page advertisement for the Adams Tella in the 1899 BJPA. Click on the thumbnail image to open a pdf copy of the complete 6 page advert. The camera has a changing mechanism, described in the text as a septum, which is pulled out from the base of the camera (when inverted as shown). This pulls the exposed film through into a chamber in the base of the camera. When returned to its normal position, the next cut film is then in position ready to be exposed. The image on the left is taken from the catalogue records for the 1898 Forty-third Annual Exhibition of the Royal Photographic Society. It shows a cross-section of the Tella camera, quite clearly identifying the changing "septum" and the path through to the lower chamber in the camera. The space at the bottom of the camera, with its separate front access, is therefore where the exposed cut films would end up after exposure. There is in fact a narrow sprung door inside the rear of the camera that provides a path through to this chamber, as suggested by the cross-section. 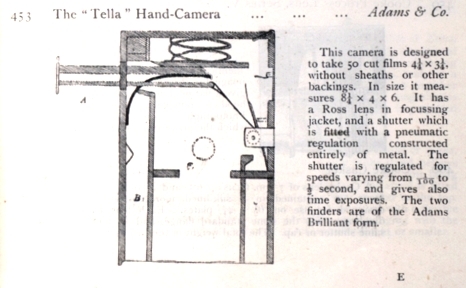 A fellow collector has been able to provide an advert from the BJA for 1900 that shows the No 3 Tella camera, which is a very good match to this example - except for the back end of course! This leads me to the view that my camera started life as a No 3 Tella but was subsequently modified to take standard film packs by removing the changing mechanism at the rear of the camera and adding a new back to take the later pattern film pack adapter. 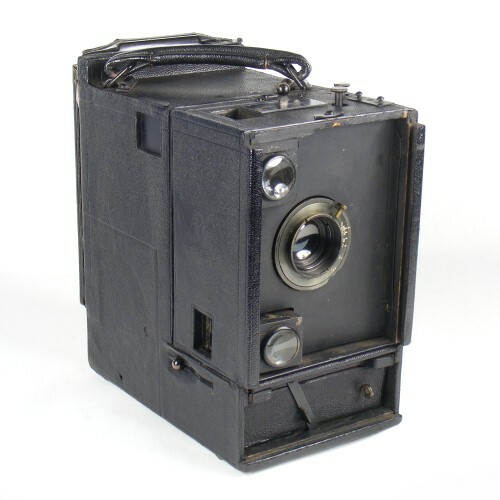 Examining the cross-section and a short description provided in the 1900 BJA, it also appears that the septum had a tensioned roller blind attached to its top edge to protect the unexposed film when the septum is pulled out. From the cross-section diagram, the location of the roller-blind assembly coincides with the unexplained chamber, hidden behind the removable metal window. There are several other pieces of circumstantial evidence. One is that the contemporary hide case that came with the camera, bearing the Adams & Co. name, is about an inch longer than the camera. The other is that on the base of the camera, at what is now the rear edge, is a depression that looks just like the sort of recess that would be provided to make it easy to place fingers around the septum mechanism to withdraw it. Furthermore, the leather used on the rear of the camera is slightly different to the main body and careful examination shows that there are joins in the material, suggesting a repair / modification. If you have an example of the Tella camera or any further information, then please get in touch.